Web design is a fast-paced field that I have a hard time keeping up with, but the fact that I have to stay up to date on my skills or risk being rendered obsolete by changing technology certainly keeps me on my toes! I have been reading and learning about WordPress for the past couple of years and was looking for a way to put what I had learned so far into practice. I learn best by doing anyway, and fake projects for tutorials are great and all, but what’s even better is finding a patient friend who needs a web site and has a limited budget but plenty of flexibility to allow me to learn as I built them a site. Enter my good friend Kelsie of Sacred Shape Hula Hoops. Kelsie and I fell in love with hooping together during several years of hoop groups on the bluffs overlooking Mendocino village and Big River Beach. She taught me a good chunk of my trick vocabulary and a few years ago she started making hoops. Kelsie is a jeweler, excellent chef, organic gardener, creative crafty type and very good with her hands. So of course once she sets out to make hoops, she makes gorgeous, high quality, handcrafted hoops with love! Over the years she has tried all different kinds of tubings, tapes, connectors, fire hoop wicks, sizes, and variations to find what works and looks best, and I’ve been happy to help try out all the different hoops along the way. 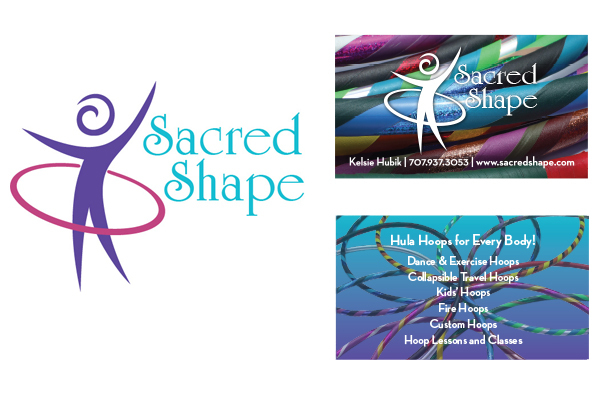 We came up with a logo concept for the business that blossomed out of her hoop-making craft, Sacred Shape, and I designed her identity and business cards. Kelsie sold hoops at a few small festivals and local events, began wholesaling hoops with the local FedEx stores, taught workshops and did a few performances with me, but soon she wanted to grow her business into something that could bring her more sustainable income. She had a friend offer to build her site but then stall for years without the project ever coming to fruition, so I offered to give it a try. We worked out a deal that allowed me time to learn the platform as I went and included partial payment in hoops. A hooper can never have too many hoops! I knew I wanted to use WordPress for Sacred Shape’s site because it allows the control of having a site on your own servers, the freedom to completely customize the site while still running it with a WP backend, and once it was set up with a custom theme design, Kelsie could easily use WordPress as a CMS to update her site without having to know code or ask me to make endless updates. WordPress has a solid community of developers behind it and is the most widely used Content Management System, as well as being open source, updated constantly, and easy to use. But I also had to choose a plugin that would securely handle the e-commerce side of the site. After a bit of research, I decided to install WooCommerce, a free, expandible plugin that processes transactions, handles the shopping cart functionality, and does all the nerdy number crunching that’s over my head. Building the site took about a year of planning, meetings, taking and gathering and preparing product and hooping photos, writing and editing content, learning WordPress and WooCommerce and just enough php to make them work (thank you Lynda.com), finding green web hosting, installing and configuring WordPress, designing a custom child theme to deck out the site with sacred geometry colorful fabulousness just like Kelsie’s hoops, and entering countless product details, descriptions, photos, prices, parameters, shipping costs, etc. etc. as I learned how to configure WooCommerce largely by trial and error. It was quite the long process, especially since we’re both so busy with other work! But the result is the first e-commerce site I’ve designed by myself and the first WordPress custom child theme I’ve ever created, and it came out so pretty that I think it was worth the wait. We launched the site at the end of September 2013 and threw a big launch party to celebrate. Kelsie and I practiced choreography for weeks and put together a fire show with friends. We had music, food and drinks, raffle prizes, and of course, lots of hooplah! Kelsie pulled together a lot of awesome people and put on an amazing event. Never has a site I’ve created been launched with such gusto! Of course, launching a web site is just the beginning of the adventure. Creating and updating it with fresh content to keep people interested, fine tuning the site’s design and code, constantly updating the site and looking for ways to improve it, keeping track of stats and improving SEO are all ongoing. I showed Kelsie how to make updates, post blog posts, add images, and edit and add products and we’re both constantly learning more and updating the site. This project has most definitely been a labor of love. Kelsie and I were friends before we ever worked together, so I’m sure that helped this project go smoothly, but our business relationship is exactly the type of connection with my clients that I crave for every freelance project I take on. I love being involved with a client’s business from the beginning and helping them express what they are all about through my designs. Especially if I’m involved early on in the creation of the business, I feel like a trusted and essential part of the team and I care about the success of the client’s business as if it were my own. It’s very rewarding being a part of the entire creative process and working with a business over the long term, carrying creative concepts through various mediums and campaigns. As a jack of all trades type designer, I love the variety of working on logos, print materials, web sites, graphics, banners, and all kinds of media, especially combined with the stability of steady work from a client over time. Building long-term symbiotic relationships with clients is what I strive for with every project, which is why I select them carefully and focus on a limited number at a time. After this project, it’s obvious that Kelsie and I make a good team whether we’re hooping or just trying to sell her hoops. Launching Sacred Shape has inspired me to keep learning as much as I can about WordPress and keep experimenting with it. I finally archived my own site that I had designed in 2005 and replaced it with a clean install of WordPress with a plain, default theme. I have big plans to build a custom child theme and try out new things here as I learn more, but of course my own site is always on the back burner since I design for others to pay the bills. Projects like Sacred Shape that combine my various passions are always a joy to work on. 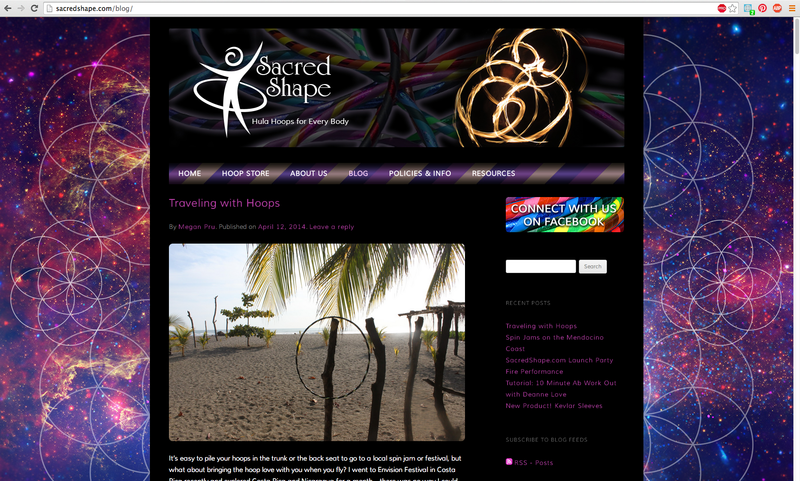 I hope that Kelsie’s web site will help spread the love of hooping and flow arts far and wide. Flow arts have played a very special role in my life and I love helping my friends go for their dreams, so this project was the perfect combination flow, friends, and lots of fun! 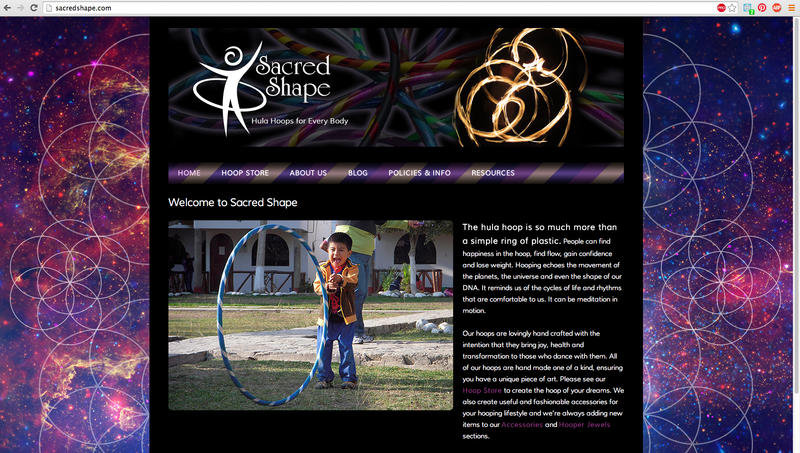 Now, everyone go order hoops from Sacred Shape! They are amazing and I’ve been hooping with them for years, plus you’ll be helping a very deserving small business blossom and doing yourself lots of good, too!